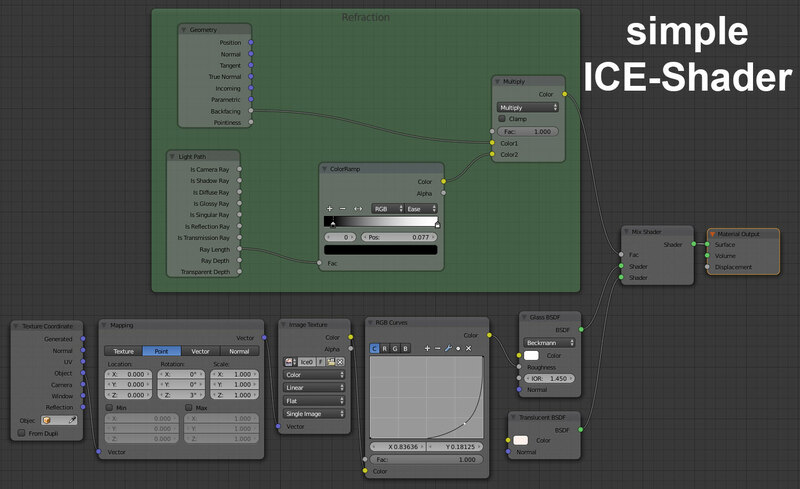 Here is my simple Ice Shader for Blender Cycles. The Node setup is very simple and easy to understand. Here is the complete Node-Setup. The first part is just a Glass BSDF Shader the Roughness is controlled by an ice texture. You can get the ice texture at CGtexture.com. Just Click on the image to download it directly. By controlling the texture with a Mapping Node you can easly controll the Mapping of the texture. The RGB Curves Node is to controll the contrast of the texture. Because we ice is not like glass we need a Translucent BSDF node to create refraction and absorbation of the ray of light. In the green Layout Frame you can see how the refraction is controlled. Just play arround with this node setup and create the ice of your choice.